A pair of Gusties were honored Monday night in their hometown of Rochester, Minn. for their athletic achievements after high school. 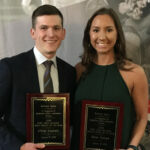 Chris Captain ’18 and Nora Holtan ’19 were named Male and Female Post High School Athletes of the Year at Minnesota’s Rochester Sports Banquet, which celebrates southeast Minnesota’s 2018 top amateur athletes. The 2018 College Sports Information Directors of America (CoSIDA) Academic All-America Volleyball Teams were announced Wednesday morning and Gustavus senior setter Nora Holtan (Rochester, Minn.) has been named to the seven-member Second Team. The CoSIDA Academic All-America Teams recognize the nation’s top student-athletes for their combined performances athletically and in the classroom. 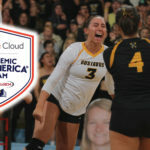 The 2018 College Sports Information Directors of America (CoSIDA) Google Cloud Academic All-District Women's Volleyball Teams are released and Gustavus senior Nora Holtan (Rochester, Minn.) is named to the eight-member District 6 Team, which features student-athletes from institutions in Michigan, Minnesota, and Wisconsin. 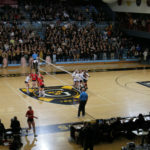 The Gustavus volleyball team suffered a heartbreaking 3-0 loss in the opening round of the NCAA Championship on its home court Friday. UM-Morris won by scores of 26-24, 25-22, and 25-20 to shock the region’s top seed. The Gusties finish the season 27-3. The No. 8 Gustavus volleyball team is set to host a NCAA Division III regional this weekend and opens the tournament at 8 p.m. Friday against Minnesota-Morris. 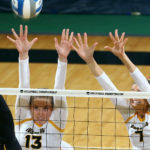 The Gusties (27-2) earned an automatic qualifier to the NCAA tournament by winning the MIAC playoffs, while UM-Morris (21-11) also earned an automatic qualifier by winning the UMAC playoffs. 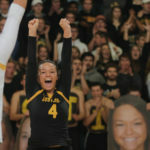 For the first time since adopting an eight-team regional format, Gustavus Adolphus College has been selected as a host site for a NCAA Division III Women’s Volleyball Regional. As the No. 1 seed in the Central Region and No. 8 team in the latest AVCA poll, Gustavus will host an eight-team regional Friday through Sunday at Gus Young Court inside the Lund Center in Saint Peter, Minn. The 2018 MIAC volleyball playoff championship could not have been scripted any better. 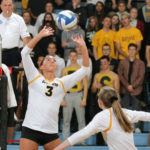 Top-seed Gustavus claimed the first two sets, while second-seed Saint Benedict answered with wins in the third and fourth, setting up a thrilling fifth. Tied 13-13, senior Hanna Albers (St. Louis, Mo.) 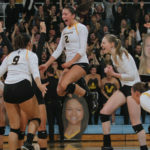 took over with a kill followed by a match-clinching ace to secure Gustavus its third MIAC playoff title in the past four years. 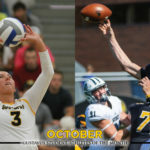 Volleyball setter Nora Holtan (Sr., Rochester, Minn.) and football quarterback Michael Veldman (Sr., Becker, Minn.) have been named Gustavus Male and Female Student-Athletes of the Month, which is voted on by the Gustavus Sports Information Department and presented by Thrivent Financial.